Whether you’re talking about productivity, speed, effectiveness, profitability — there are a lot of ways to say efficient, but around here, the term is most synonymous with the DA 350. The unit is the first and currently the only sealcoating machine on the market that allows you to use one machine to tackle all four tasks associated with sealcoating jobs: 1, blowing/cleaning, 2, cutting in, 3, spraying, and 4, squeegee application. It’s an efficiency powerhouse and — in terms of doing more in less time when it comes to sealcoating — it can be your best friend. Here’s how. A powerful, 6,000-cfm blower attached to the front of the machine quickly and easily cleans the surface with just the flip of a switch as you’re seated in the driver’s seat. You can even blow dust and debris at any angle thanks to the blower’s 360-degree rotation. Gone are the days of having someone hold a shield board as an operator sprays material. An AutoTrim baffle attached to the front of the DA350 automatically protects curbs and edges from material while a spray nozzle coats the surface — all while the single operator sits at the wheel.Combined with the machine’s high-powered blower, you can achieve prep work as much as seven times faster than manually performing the prep work. Spraying is the most popular sealcoat application method and rightfully so. It’s quick and delivers smooth, uniform results. 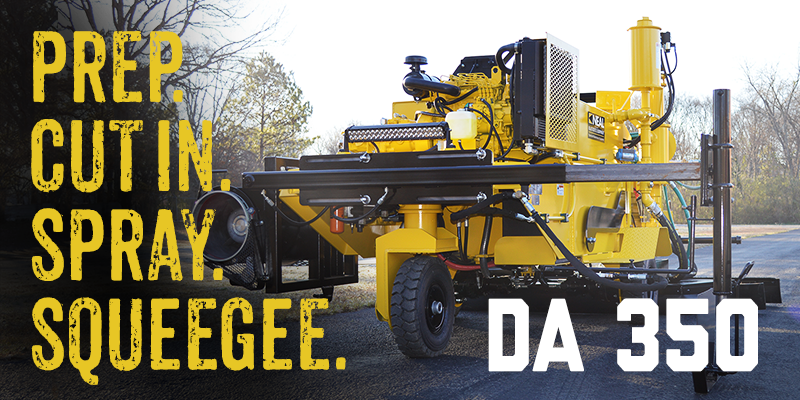 The DA350 has a hydraulically activated spray bar, making it ideal on nearly any size job. The unit’s 6-foot hand wand and 75 feet of reinforced hose add even more jobsite versatility. Spraying sealcoat is good, but if you want to get the greatest quality and longevity from your work, a combination of spraying and squeegeeing is best. This is why, in addition to a spray bar, we equipped the DA350 with an 8-foot-wide squeegee. It’s the most effective way to fill voids in a rough, porous pavement, and it provides a strong bond.Together, spraying and squeegeeing can deliver a sealcoat that lasts as much as 40 percent longer than either method alone. Learn more about the DA 350 or other ways to get the most ROI from your sealcoating equipment.